In the state of Virginia, there are many criminal charges that can result in a misdemeanor. While no one wants to face any arrest, a misdemeanor charge is a far more favorable outcome than a felony charge. However, misdemeanors can still mean time behind bars while you are awaiting trial. The reality is that the sooner you can post bail and get out of jail, the better shot you have at getting your life back on track and working on a solid defense with an attorney. As your local bail bond company in Roanoke, we can help with posting misdemeanor bail. 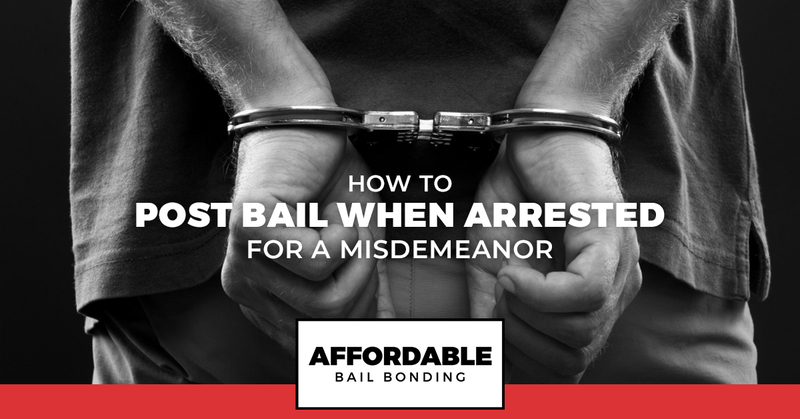 Read on to learn more about misdemeanor charges and how to post bail when you are arrested for a misdemeanor. Misdemeanor charges are considered lesser charges than felonies. For this reason, they carry smaller penalties and punishments. However, just because a misdemeanor isn’t as life-altering as a felony doesn’t mean there aren’t a hefty amount of consequences associated with these charges. In Virginia, misdemeanors fall into four classes. Class one misdemeanors are the most serious of the four classes, with class four being the least serious. Some crimes can fall into more than one class depending on how the judge determines to rule and depending on your past criminal record. For example, driving while intoxicated (DWI) could wind up being a class one misdemeanor if it is your first offense. However, if you were arrested and charged with a DWI and a minor was present in the vehicle, you could be facing a much more serious charge. If you receive a phone call that your loved one has been arrested for a misdemeanor and can post bail, there are some easy steps you can take to help them. The same is true if you were the one arrested. Facing an arrest is a scary situation. You can be left feeling helpless and uncertain of what to do next. The good news is that when you reach out for the help of a professional bail company, you don’t have to face the justice system alone. Working with a bail bondsman provides you with an array of benefits. First, they understand exactly what steps need to be taken and how to reach the right people. This means that you will spend less time behind bars. Secondly, a bail bondsman will make posting bail more affordable. Instead of paying the entire cost of bail upfront — which is often simply impossible for the average person — you only pay a percentage of your bail amount. In the United States, it is your right to be considered innocent until proven guilty. For this reason, you should be allowed to post bail and go home to await your trial no matter what your financial situation is. 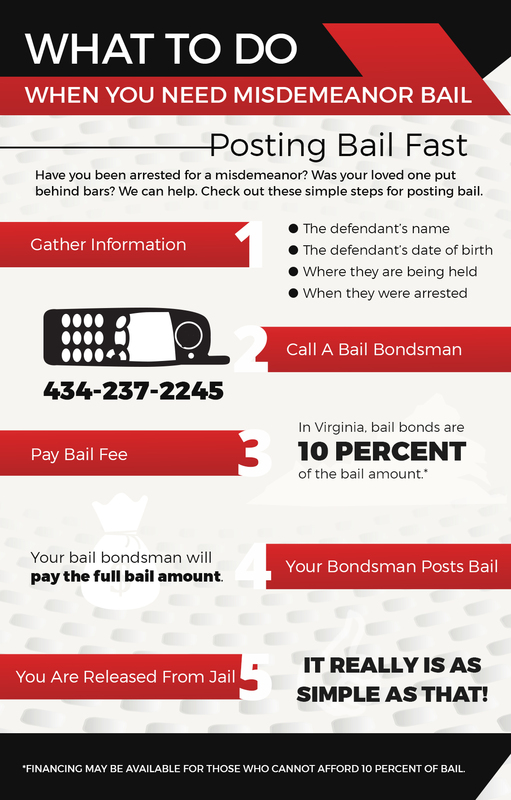 Need help posting misdemeanor bail in Roanoke or a surrounding community? Our team can help. Contact us today for further assistance. We are available 24/7 to help you post bail.